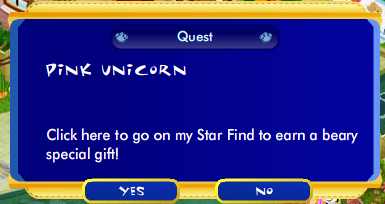 Unicorn Quest in the Neighborhood! Be sure and visit the Unicorn in the Neighborhood!! She arrived this morning with Buildabearville’s update! 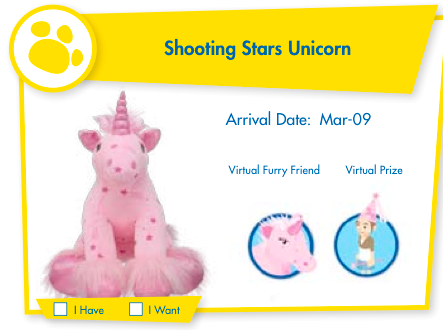 The new Shooting Star Unicorn comes to Buildabear Workshop on March 20! 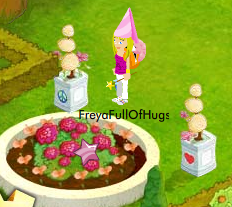 As shown in this pic from the Furry Friend Hall of Fame her psi (pet special item) will be a princess hat and wand! If you are trading for these items, don’t get them confused with the princess hat that came with the costume for sale in Paulette’s Coufur at Halloween time (note: no unicorn on the costume hat) or the wand that was a fountain item in July 2008 (note: the blue ribbon on the fountain wand)! 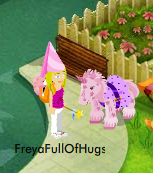 FreyaFullofHugs is shown wearing both! Though both are now rare they are not the same as the Unicorn psi. 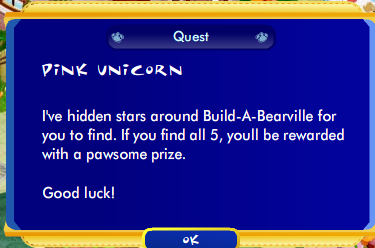 Click on her to start your quest of finding 5 purple stars hidden around Bearville. Find all 5 and be awarded this lovely dollhouse! 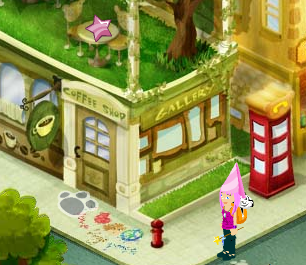 Hugs for You Monkey Quest in Neighborhood!